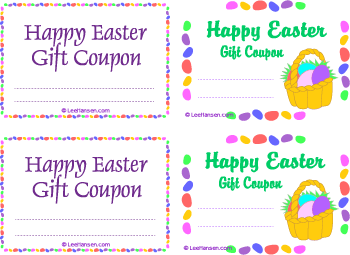 Printable Easter gift coupons in two designs, a total of 4 on a single sheet. Each coupon has lines for you to add your gift details. Cut apart the sheet of 4 jelly bean border coupons - they're just the right size to add to fillable eggs or tuck into a greeting card. Printable Easter gift coupons, blank - 3" x 4.5 Adobe Acrobat Reader, PDF format. Print a sheet of gift coupons on plain paper or on photo paper and cut them apart. Write in your own special gift treat plus to/from information.